Microsoft Kaizala is a secure chat and messaging app that lets you send and receive instant messages, coordinate tasks, take actions, gather feedback, compile reports, and more. Signing up and getting started with Kaizala takes only a few moments. On your mobile device, download Microsoft Kaizala from the Google Play Store. Enter your name and phone number, and then tap Next. 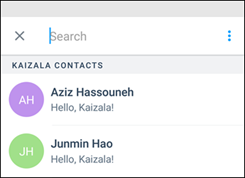 Allow Kaizala to verify your phone number and import your contacts list. You are ready to set up your profile and start using Kaizala. At the bottom of the screen, tap Profile . Tap your name or the edit profile icon to add your designation, location, and email address. Tap the camera icon to update your profile picture. Tap the edit status icon to update your status. 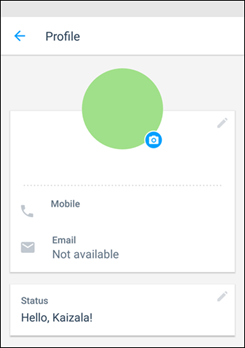 Select the contact you want to chat with from the list to send them a message. Tap Chats > New Group . Enter a name for your group, and then tap Next. To add contacts or groups, scroll through the list to add them or search for them in the search box. Tap Done to create your group and it will show up on your chat list. Tap Chats to start or open a chat. Tap Kaizala Actions > Let’s Meet. Enter a meeting title, choose the date and time, and then choose the duration. Enter a location, or choose your current location, or search for a location and then choose it. Choose Responses visible only to me, if you prefer. Users respond by choosing Yes, No, or Maybe. 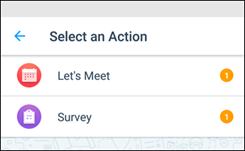 To view a snapshot of responses, in Kaizala Actions, choose Let’s Meet. Tap Profile > Action Items. Choose an action type to see the type organized by received and sent actions. Choose an action from the list to engage in that conversation. Use the back arrow to go back to the pending actions lists. 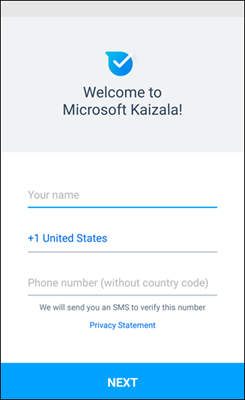 On your mobile device, download Microsoft Kaizala from the Apple App Store. Tap your name to edit your profile. Tap the edit profile icon to add your designation, location, and email address. At the bottom of the screen, tap the People tab. Tap Chats > New Group. 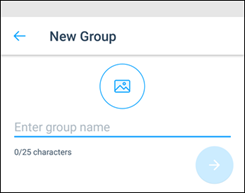 Enter a name for your group and, optionally, set a group picture. At the bottom of the screen, tap the Discover tab. Tap Kaizala Actions, and then choose Let’s Meet. Tap Try this Action. Select the chat to set up a meeting. Select Show results only to me, if you prefer. Tap Send to send the meeting request. 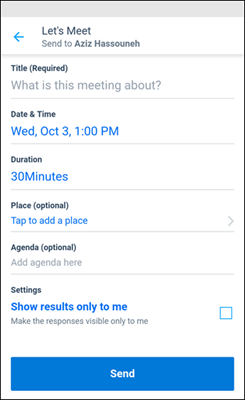 To view a snapshot of responses, tap Chats, tap on the chat and tap on the meeting request. On your computer, go to https://webapp.kaiza.la/ in your Microsoft Edge or Google Chrome web browser. 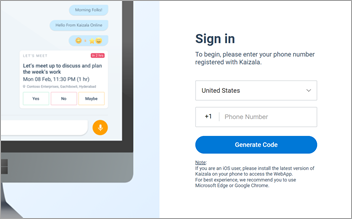 Enter your Kaizala phone number, and then select Generate Code. On your phone, from the Kaizala app, go to Chats > More > Kaizala Web (Preview) to view the pairing code. On your computer, on the Verify Code page, enter the pairing code, and then select Verify & Sign in. You can now use Kaizala on your computer and the mobile app.